Furnished residence; spacious open floor plan. Gated entrance, gorgeous yard & finished walkout lower level. Owner has initial investment of $1.183+. Custom design & upgrades throughout including 2-panel doors, open floor plan, hardwood floors & gourmet kitchen! Upscale quality you've been dreaming of @ a really great value per sq. ft. Tranquility at its finest! Stunning kitchen w/upscale appliances Wolf, Thermador, granite, triple crown moldings, 8' front doors, what's not to love! Theatre room seats 6 w/~110" Sony TV screen incl. Jack n Jill baths + a 2nd floor bonus room + Nest thermostats. Don't miss the chandelier in the cupola. A finished walkout lower level + 2 decks to watch AMAZING sunsets. Custom Ridalco sink 2 bathe dogs/pets too. Extra storage +a totally finished oversize 3-car garage. Sherman Hospital is 5.4 miles away; Randall Biz Park, Elgin Corporate Center +Elgin Academy [private pre-school to 12]; note District #300 schools. Credit report & background check required. Stunning 5 Bed/5 Bath Estate Home on a private picturesque 1.78 acre lot in sought-after Stonecrest subdivision. Burlington Central 301 Schools! Dual staircase entrances to both upstairs and basement. Executive open floorplan with family room, casual dining & kitchen along the back of the home, accessing the huge back deck which captures beautiful sunsets over the wetland out back. First floor Office could be converted into an In-law Suite with adjacent full bath. Lovely Master Suite with whirlpool tub and separate shower, his/her vanities, walk-in closet. 2nd & 3rd Bedrooms set up with Jack & Jill bath including separate vanities & walk-in closets. Guest room has bath also. 2nd floor laundry/craft room & a separate exercise room. Walkout finished lower decorated in a cozy "log cabin" theme w/wet bar & full bath. Fire pit in private backyard overlooking conservation area. Dual-zone HVAC, central vac, whole-house fan, Generac generator. Furnished as shown & available on June 1st. Imagine the memories you and your loved ones will make in the huge yard and the sun drenched open floor concept of this exquisite custom built 2 owner home overlooking Forest Preserve! Dramatic soaring ceiling of Foyer and family welcomes all who enter this spacious Estate. Floor to ceiling windows adorn the back of this home allowing the sunlight to flood in. Nestled on quiet tree lined street Rolling Knolls Estates on private, 1.1 acre landscaped yard with over 4000+ sf; home was updated in 2018 with new carpet, new flooring and has newly painted exterior and interior. Large kitchen and dining, Family Room area offer wonderful open space to entertain. Unique home is a tranquil oasis. 3 car garage, has a bonus space for work shop and or tandem 4th car parking. Available June 1st - Executive 4 bedroom 4 bath home, located on a corner lot adjacent to green area. Kitchen with granite, ss appliances, island with seating and separate eating area with access to the large, fenced yard with brick paver patio. Iron and oak railings, two story family room with fireplace, formal living and dining room, office or 5th bedroom on first floor as well as full bath (could be an in-law arrangement). Large master bedroom with luxury bath and with access to closet, two more bedrooms with Jack and Jill bath and the fourth bedroom has its own private bathroom, full unfinished basement to make your own and a side load 3 car garage. District 301 schools. FULLY EQUIPPED THEATER ROOM. Rents range from $2,200-$2,800. To view our models, please visit 1212 & 1214 Bradley Circle. Will waive security deposit with qualifying credit. Gorgeous New Construction Townhome features fireplace with gas logs, sumptuous master suite with two showers and two sinks, hardwood floors throughout, attached garage, theater room with eight seats, finished basement space, open floor plan, chef's kitchen with stainless steel and granite, tons of natural light, Don't Miss! Big Home Great floor plan, Granite counters in open kitchen w/ walk-in pantry, 1st floor Den, English basement, 1st & 2nd floor family rooms, Master has TWO HUGE walk-in closets. 3 car garage,Deck. Available now. Executive rental available in popular Bowes Creek Country Club.Small Dog considered! Spacious open floor plan offers gleaming hardwood floors & wrought iron staircase. Family room features gas fireplace & formal dining room has a cove ceiling. The well-appointed kitchen features 42" cherry cabinets, granite counter tops, stainless steel appliances, island & pantry closet. The sunny breakfast nook has a skylight & French door leading to the deck overlooking beautifully landscaped common areas. The expansive master bedroom boasts a cathedral ceiling, a large walk-in closet & a luxurious master bath with sunken tub, separate shower, & a dual-sink vanity. The 2nd bedroom has a cathedral ceiling & the 3rd has a cove ceiling. Finished basement. Enjoy golfing & restaurant in this beautiful community. NO PETS & NO SMOKING. $50 BACKGROUND AND CREDIT CHECK FOR ALL OCCUPANTS OVER 18 YEARS OF AGE. 1 YEAR LEASE MINIMUM. CALL AGENT FOR ADDITIONAL INFORMATION. Do not miss this opportunity in desirable School District 301! This beautifully maintained open concept offers enormous space on two levels of living with 3 balconies. Living room with wood burning fireplace. Flat screen TV will stay. Separate dining room opens up to the kitchen with upgraded cabinets and stainless steel appliances. Master suite comes with walk-in closet. Den/Family Room could easily serve as a forth bedroom or office if needed. Lower level offers unfinished room that could be used for storage. Attached 2 car garage completes this desirable, maintenance free home. No pets. No smoking. Rental Insurance required. Credit Score 650 or higher. Available immediately. AVAILABLE 1st APRIL - Hurry, before it's gone! Quiet, nature filled location & yet minutes from retail, restaurants, college, golf, expressways & train station. 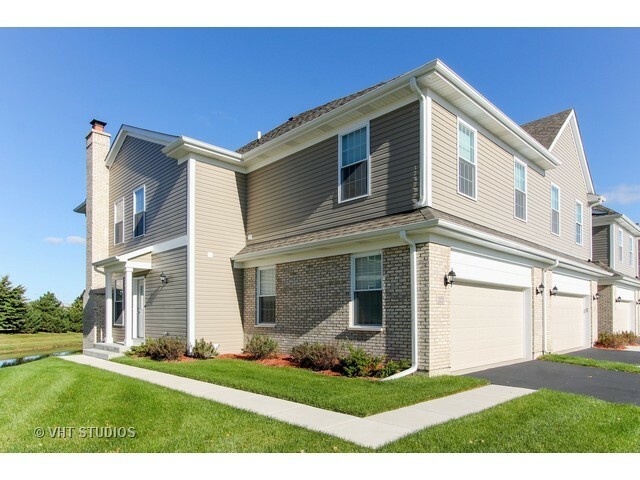 Townhome with 2 bed, 2.1 bath, 2 car garage & a spacious floorplan & a big kitchen! Sorry no short term lease. You love this location & townhome. Minutes to Randall Rd, elementary school, Walmart, Sam's Club, Meijer, Menards, restaurants, large retail strip, golf, Elgin Community College and more!!! Application, Credit 680+, Background check, at least 2 years same job income required or equivalent.